Thank you to everyone who submitted an entry. I know most of you wrote from the heart and I really appreciate that. It was great to see how Eid 2011 will be special and different to you guys. InshaAllah, the positive changes we have made during Ramadhan will stick with us throughout our lives and that He may continue to guide us and give us strength to lead our lives as Muslims. This is the tough part... unfortunately, I can only pick one winner. Congratulations to Izyan Darling! 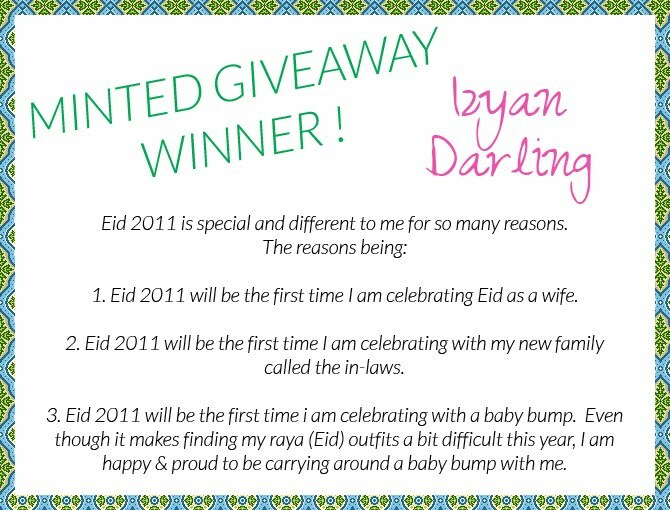 I'm sure celebrating Eid as a newlywed with a baby bump is going to be very special for you. Congratulations on so many levels, Izyan. I'll make sure Minted will be in touch with you soon. Eid Mubarak and Selamat Hari Raya in advance to all. May Allah swt accept our good deeds and forgive us for our shortcomings. awww thank u so much for choosing me as the winner! i am so thrilled! i've received an email from Minted and i look forward to ordering the cards yeay! thank you once again & hope u had a lovely Eid with your loved ones.